What is irritable bowel syndrome (IBS) and who does it affect? Irritable bowel syndrome is a common condition that gives rise to recurrent bouts of abdominal pain & discomfort. Typically it occurs in association with changes in bowel function leading to diarrhoea, constipation or a combination of both. It can affect in both men & women of all ages , although it is more common in younger people and is twice as common in women compared to men. Pain in the abdomen which comes on from time to time. 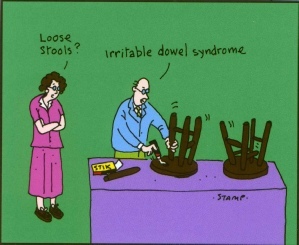 The pain often eases when you pass stools (faeces) or wind. The severity of the pain can vary from mild to severe. Bloating and swelling of the abdomen, and passing more wind than usual. Bouts of constipation and/or bouts of diarrhoea. Some people may also pass mucus. The stools may become small and pellet like, or watery and ribbony. A feeling of not emptying your bowels after going to the toilet. Urgency, which means you have to get to the toilet quickly. Less common symptoms include: feeling sick, headache, belching, poor appetite, feeling quickly 'full' after eating, heartburn, and bladder symptoms (an associated 'irritable bladder'). Some people have occasional mild symptoms. Others have unpleasant symptoms for long periods. Many people fall somewhere in between, with flare-ups of symptoms from time to time. IBS is common and can affect anyone at any age. Is irritable bowel syndrome known by any other name? The cause of IBS is not known. It is often referred to as a diagnosis of exclusion. This means that it is diagnosed only after other causes have been excluded. Infection, allergy or inflammation do not appear to be directly responsible for irritable bowel syndrome. However certain factors may bring on symptoms. The two commonest factors are stress & anxiety and certain foods (food & mood). Psychological factors including stress and anxiety appear to play an important role in IBS. Increased stress may makes symptoms worse or may even bring on symptoms of abdominal cramps or diarrhoea in individuals who have never been diagnosed with IBS. It is not uncommon for patients to notice IBS type symptoms persist after an episode of food poisoning. It seems likely that such attacks may lead to a prolonged increase in sensitivity of the bowel, leading to typical IBS symptoms of cramps, bloating and altered bowel function. There is no test that confirms the diagnosis of IBS. Your doctor will usually be able to diagnose IBS from the typical symptoms. However, on occasion, it may be necessary to perform specialised tests before being able to give a confident diagnosis of IBS. These tests might include blood tests to exclude anaemia & coeliac disease and stool samples to exclude infection or inflammation. Your doctor may also recommend taking a lactose-free diet for 2 weeks to make sure that symptoms are not related to lactose intolerance. Your doctor may also recommend a colonoscopy to exclude colitis or other bowel problem. This is not necessary for every patient with irritable bowel syndrome. However, it is often recommended if blood tests show anaemia or if additional symptoms such as weight loss or rectal bleeding are present or if the symptoms begin later in life (over the age of 45 years). What other conditions can cause symptoms similar to irritable bowel syndrome? A high fibre diet (or fibre supplements) may help if constipation is a main symptom. However, in some people with IBS, especially those with diarrhoea, extra fibre may make symptoms worse (particularly bloating). Diet. Some people with IBS find that one or more foods can trigger symptoms, or make symptoms worse ('food intolerance'). If so, you can cut out that food or foods. The commonest food intolerances that cause IBS symptoms in the UK are to: wheat, rye, barley, dairy products, coffee (and other caffeine-rich drinks such as tea and cola), and onions. Antispasmodic medicines relax the muscles in the wall of the gut. There are several types which work in different ways. Therefore, if one does not work well, it is worth trying a different one. If one is found to help, then you can take it 'as required' when symptoms flare-up. For example, for a week or so at a time to control symptoms when they flare-up. An anti diarrhoea medicine such as loperamide can help if diarrhoea is a main symptom. An antidepressant is sometimes used. In particular, it tends to work best if pain and diarrhoea are main symptoms. (Antidepressants have other actions separate to their action on depression. They are used in a variety of painful conditions, including IBS.) Unlike antispasmodics, you need to take an antidepressant regularly rather than 'as required'. Treatments to reduce stress and anxiety. Stress and anxiety can trigger symptoms, or make them worse. Some people have found such things as relaxation techniques, stress counselling, cognitive behaviour therapy, psychotherapy, and similar therapies useful in controlling symptoms of IBS. Various other treatments are sometimes used such as herbal medicines and probiotics. However, more research is needed to clarify their role. Newer drugs that affect the gut are also being studied and may become useful treatments in the future. What is the outlook or prognosis for irritable bowel syndrome patients? Irritable bowel syndrome may be a lifelong condition. For some people, symptoms are disabling and reduce the ability to work, travel, and attend social events. Symptoms can often be improved or relieved through treatment. However, it is important to remember that IBS does not cause permanent harm to the inte stines, and it does not lead to a serious disease, such as cancer. Where can I get more information on IBS? If you have any further questions about irritable bowel syndrome or other colorectal issues, your own GP is often the best first port of call. Irritable bowel syndrome (IBS) is a common & distressing problem, which causes recurrent abdominal pain & discomfort. It is usually accompanied by alteration in bowel function, diarrhoea, constipation, or a combination of both. There are a number of different causes and treatment options. What is irritable bowel syndrome (IBS) and who does it affect?What are the symptoms of irritable bowel syndrome?Is irritable bowel syndrome known by any other name?What is the cause of IBS?How is IBS diagnosed?What other conditions can cause symptoms similar to irritable bowel syndrome?How is irritable bowel syndrome treated?What is the outlook or prognosis for irritable bowel syndrome patients? Where can I get more information on IBS?